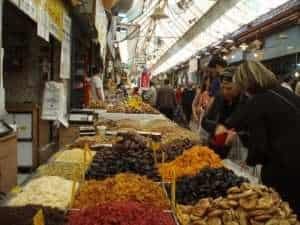 While the Machane Yehuda Market for many years was the cheapest and most convenient place for locals to shop, in recent years it has maintained these qualities and grown to offer far more. Together with the stalls are a number of hidden gems that you should be sure to check out while in Jerusalem. For instance, if you want a break from the Middle East and prefer the idea of London’s East End then stop by FishenChips. The mustard and beer battered fish is delicious and you can choose between cod, tuna, salmon, panko and more. Of course the accompanying chips are also excellent and the overall experience is more than enough to justify a trip to the market. To stay close to the Middle Eastern vibe you can visit the Shem Tov Café. There you can enjoy some amazing home-cooked food which combines the Middle East with Italian and Greek touches and authentic Jerusalem beer. The chef behind the scenes, Shmil Holland, offers cooking workshops and wine tasting sessions which are great fun and an excellent group activity. The market also gives you the chance to experience a tiny slice of Paris courtesy of the Mousseline Ice Cream shop. The owner learned the art of making ice cream and desserts in France and offers a great range of unusual flavours such as sour cherry and grapefruit basil. They also import teas from a Parisian tea house while the coffee is made with Brazilian and Ethiopian beans. For a bit of true market history make sure you stop by Azura. The manager’s father opened the restaurant in 1952 and it is now run by nine Azura siblings. The restaurant attracts a range of clientele from celebrities to locals and offers great food at low prices. The food is a mixture of Kurdish, Iraqi, Sephardic and Tunisian dishes and the kubbeh soup is particularly renowned. If you’re missing pizza then the market has the answer in the form of Pizza Flora. The pizza is made fresh while you wait and you can also enjoy pasta, wine, beer and fresh Italian salads while you’re there. The possible toppings are extensive, from the traditional to the more exotic, and you are sure to leave feeling completely satisfied. Another restaurant steeped in the history of the market is Jacko’s Street. The owner of the restaurant grew up helping at his father’s fish business before going on to open his own restaurant. All the ingredients used are fresh and bought in the market and his father’s store. You’ll find a range of fish and meat dishes which have been created by the owner Zakai who attended a culinary school before setting up the restaurant. For a more upmarket experience you can stop by Machaneyuda, perhaps one of the most famous restaurants in Jerusalem. It is run by three well-known chefs with a menu that changes daily depending on the chefs’ mood and what is available in the market that day. However, it’s quite a pricey place so probably best saved for special occasions.